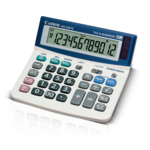 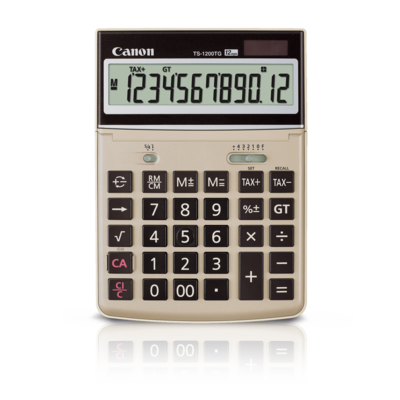 Canon introduces the TS-1200TG desktop calculator. 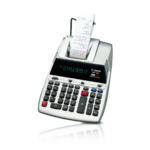 Easy-to-operate, the TS-1200TG is made from the recycled materials of Canon copiers, featuring 100% post-consumption recycled plastic upper and lower casings. 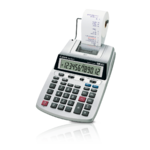 Perfect for your school or home office, the TS-1200TG features a 12-digit adjustable display and a variety of commands, such as tax functions and grand total. 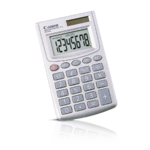 Boasting a champagne gold colour and large LCD display, the TS-1200TG is the ideal calculator for any school or home office setting.